SwordGrip is a memory course featuring key verses from each book of the Bible. The SwordGrip series is contained in three separate flipbooks, each containing 28 weeks of memory work. SwordGrip Old Testament - Vol. 2: Coming soon! Each flipbook includes detachable verse cards, stickers to mark each week's recitation, and Grip-it-Tighter Questions. Available in KJV, NKJV, and ESV. Each SwordGrip verse is color-coded to help you memorize. If you've never memorized before, start with one verse a week by learning the key verses only. When you're finished, go back to learn the others. 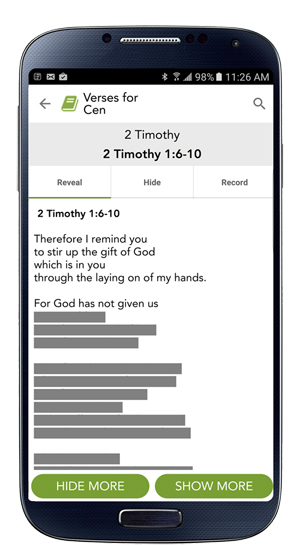 SwordGrip also features a memory image for each week's verses. Picturing the image in your mind will help jog your memory when reciting. Take your verse cards with you to practice them anytime! Just cut them out and attach them to the included metal ring. The first letter of each verse is printed on the back of the cards to help with memorization. When you're ready to quote, just hand your verse cards to your hearer. With the optional Teacher's Guide, you'll have everything you need to get started right away — including a suggested structure, schedule, and group game ideas. Get the physical copy for $1, or download the PDF absolutely free. Use the included stickers to commemorate each week's recitation. Did you recite your verses with one help per page or less? If so, place your sticker in the gold circle for that book! Two helps per page earns silver; three helps per page earns bronze. 28 stickers are included with each flipbook. Extras are available upon request. The SwordGrip Scripture songs make memorizing each week's verses a blast! Crank up the volume, sing along, and you'll have the verses memorized in no time! New Testament only. Click here to learn more. Have an Amazon Alexa device? Try adding the SwordGrip skill! Once you've added it, you can say things like, "Alexa, ask SwordGrip to review my James verses." Enabling the SwordGrip skill is easy. Search "SwordGrip" in the skill store, or simply click here. New Testament only. Already using SwordGrip? Click here for free resources.